What if I told you that you could get some time each day to do whatever it is you would like to do while your child was awake? You could clean, make phone calls, cook, or even read a book, all while your child played happily in his/her room! This is fully feasible. I have had all four of my children do this from very young ages. I have always loved that I implemented this concept into our days, but never more than when my children got old enough they were no longer napping. This still gives me a time of day when I have a chance to myself. A time when I can complete a sentence in my own head without being interrupted by an inquiry from a child. Even in summer break, I can get an hour each day. 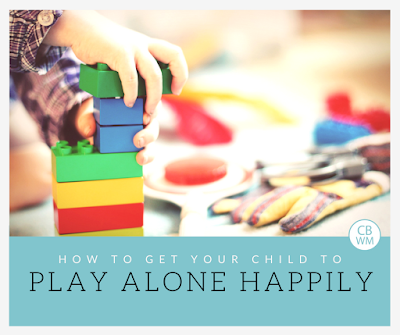 The goal is to have your child play alone in a room where he/she can’t see you for a set amount of time each day. The length of time will vary depending on your child’s age and how well he/she can play independently. It might be as short as 5 minute initially. You will work up to 60-90 minutes over time. I also find great benefit in the mood of my children. Even my extroverted children in the end enjoy some time to themselves each day to play how they want to and with the toys they want to. Playing independently for a bit is rejuvenating to them and they are happier and more pleasant for the remainder of the day. You want your child to be in a place where you child is alone. It is unreasonable to expect your child to play alone where he/she can see you. Your child will focus and gain the benefits listed above if he/she is truly alone. There are types of structured play when your child will play independently with you around. Those have other benefits and are worthwhile. The goal for this independent playtime is alone. With a newborn (yes, I start working at this concept at newborn! ), I have my little one lay at the activity gym and “play” for five minutes without me talking to the baby and interacting with her. I always sit right close to the baby since she is a newborn. That way I can keep an eye on the baby. Newborns can’t see far, so your baby won’t be able to see you. As the baby gets older, I extend it to ten or even 15 minutes and sit as far away as I need to in order to remain unspotted. The length of time will depend on the baby’s abilities. For the best success at this independent playtime day after day, you will want to have it at a consistent time of day. When we are first starting independent playtime, I choose to do it more in the morning hours when my children are happier and more alert. I like to avoid a time close to nap so I lessen the risk of them falling asleep in independent playtime. Once my children drop to one nap a day, I continue that in the morning hours because the afternoon is filled with a nap. When my children are at no naps and/or in school, I typically do the afternoon right after lunch. It is a nice break for them to get some time alone. In the summer, it ensures they are inside at the heat of the day. When it is time for independent play, be cheerful and happy about it even if your child is not initially. Go to the space or room for independent playtime. Get some toys out for your child to play with. If this is in a pack and play (or you can use a crib even! ), those will be the only toys your child plays with. If it is in the room, your child might pull out more toys. I don’t mind my children getting more toys out; I just don’t want my child pulling everything out for the sake of pulling everything out. A timer is a fantastic tool for establishing Independent Playtime. Set the timer for your child when first starting out and end independent play when the timer goes off. You can play some music or some audio books in the room while they play. We initially tried a CD player in our early days of parenting, but children easily scratch CDs (ha!). We moved to an iPod. We now use Sonos speakers in our home (affiliate link). Once the playtime is over, go to your child and once again, be cheerful no matter how your child is acting. have your child help in the best way he/she can to clean up. In the younger months, it might just be baby watches you clean up. You might hand a toy or two to your baby to put away. As he/she gets older, have your child help out. This is a great precedent for your child to learn to clean up after self. 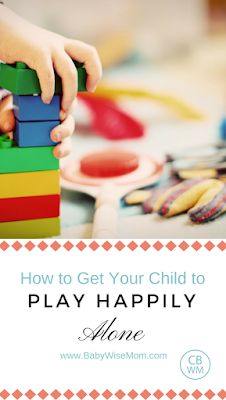 If you are starting independent play with an older child, see this post for help on doing that. Your child can develop the skills and ability to play independently. It will be a great benefit to your child and to you. This is one of my favorite parenting helps from the On Becoming -Wise series of books. You will love the benefits that come all around from this tool!